We are John and Shelagh Prescott. We live and work on our farm on the edge of Longhorsley, near Morpeth. Our farm is also home to our exotic animals accumulated over the years. John has a collection of tortoises, mostly rescue animals from the surgery, but also some rare yellow headed ones which he has been successfully breeding. Gaby is our second camel, a pure bactrian. Our first camel, Gloria, was a cross bred and huge. We still have a few llamas, wallabies and emus together with many other birds. Our farm is 40 acres and together with Sam’s land, which he rents, the holding is 60 acres. We are 25 miles north of Newcastle on the Road to Coldstream, 100 miles from Edinburgh and only 2 miles off the A1 ( view a map here). We have sold sheep to Scotland and Orkney, Germany and Estonia, Isle of Man, Ireland and in England. We sell sheep at Skipton, the RBST show and sale, at Melton Mobray, at Carlisle and off the field. We sell fleece and sheepskins at Woolfest in Cockermouth and online. The West End Wensleydales was established in 1986 with a few white ewes and a Fishwick ram. Two years later we bought our first black sheep, a ewe and a ram Scotston Moor. 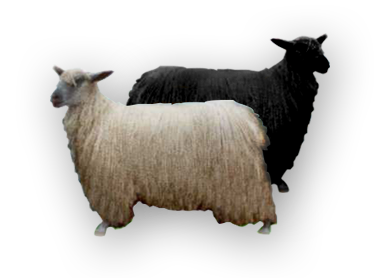 Since then we have concentrated on breeding animals with good size and conformation and wool quality in both flocks. At present we have over 40 white ewes and 15 blacks and their lambs, six shearling rams, five 2-shear rams and the senior tups and some 35 yearling ewes. We no longer take part in the MV accreditation scheme but for export orders the sheep can be blood tested for MV and scrapie resistance. Testing takes up to 2 months and for the last test the bloods must be taken no more than 1 month before transportation. We have a number of bloodlines and can generally supply ewes with an unrelated ram. You will find more information about our show appearances here.